As a dietary supplement, take one or two 1/4 level teaspoons 1 to 2 times daily with or without meals. Shake plastic tube before using. Snap top off of tube and squeeze liquid contents into mouth and swallow. Take 1 tube 1 to 3 times daily. Please recycle plastic tube. Purified Water, Vegetable Glycerin, Malic Acid, Citric Acid, Natural Fruit Extracts And Flavors, Potassium Chloride, Potassium Sorbate, Sodium Benzoate, And Lemon (Citrus Limon) Oil. Contains No Sugar, Starch, Yeast, Wheat, Gluten, Corn, Soy, Milk, Egg Or Artificial Colors/flavors. Contains No Sugar, Starch, Yeast, Wheat, Glutin, Corn, Soy, Milk, Egg Or Artificial Colors/flavors. Distilled Water, Vegetable Glycerin, Malic Acid, Citric Acid, Natural Orange Flavor, Natural Vanilla Flavor, Potassium Sorbate, And Lemon (Citrus Limon) Oil. Cellulose (Capsule), Cellulose, Magnesium Stearate (Vegetable Source), And Silica. As a dietary supplement, take 1 tablet 1 to 3 times daily with or without food. Natural Carnitine is found primarily in red meats, so vegetarians may need to supplement to ensure healthy levels in their bodies. Our Carnitine is a synthetic product manufactured in a laboratory using bacterial synthesis, and is considered vegetarian due to the absence of any animal sources or by-products. 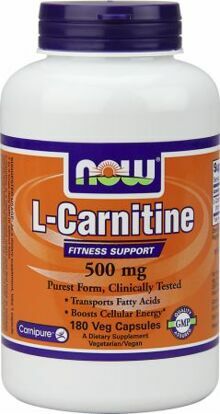 Now L-Carnitine is also available in 1000mg Tablets, Liquid Carnitine, Triple Strength Liquid Carnitine, and Acetyl L-Carnitine. Consider taking this product in combination with NOW CLA and NOW Lecithin Triple Strength.